We will be accepting new vendor registration July 1, 2019. Our Christmas show will be taking place November 28, November 29, November 30, at the Entrec center located at Evergreen Park. Our Hours are November 28 12-9pm, November 29 12-9pm, November 30 10-6pm. Come out and support all our local crafters, there will be something for everyone. The Farmers Market is offering a kids zone again this year, equipped with bouncy houses, clowns and sand art as well as Santa who will be taking pictures again this year. This is a great family event so be sure to stop down. 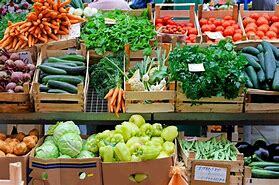 Our Wednesday markets will be starting July 10 we cannot wait for all the fresh, local produce to be available.